October 17, 2016 – Orbital ATK successfully launched the Antares rocket carrying the S.S. Alan Poindexter Cygnus spacecraft at 5:45 p.m. MDT. The Cygnus spacecraft will berth with the International Space Station (ISS) at 5:05 a.m. MDT on October 23. Expedition 49 astronauts Takuya Onishi of the Japan Aerospace Exploration Agency and Kate Rubins of NASA will use the space station’s robotic arm to grapple Cygnus. 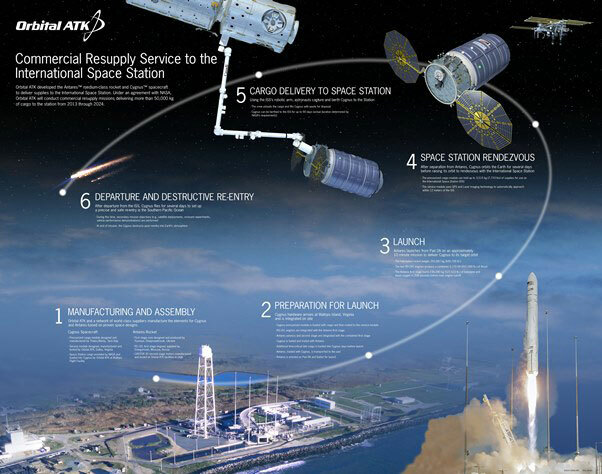 Orbital ATK’s Cygnus spacecraft launched from the Mid-Atlantic Regional Spaceport’s Pad 0A on the company’s upgraded Antares 230 rocket carrying more than 5,100 pounds of cargo. 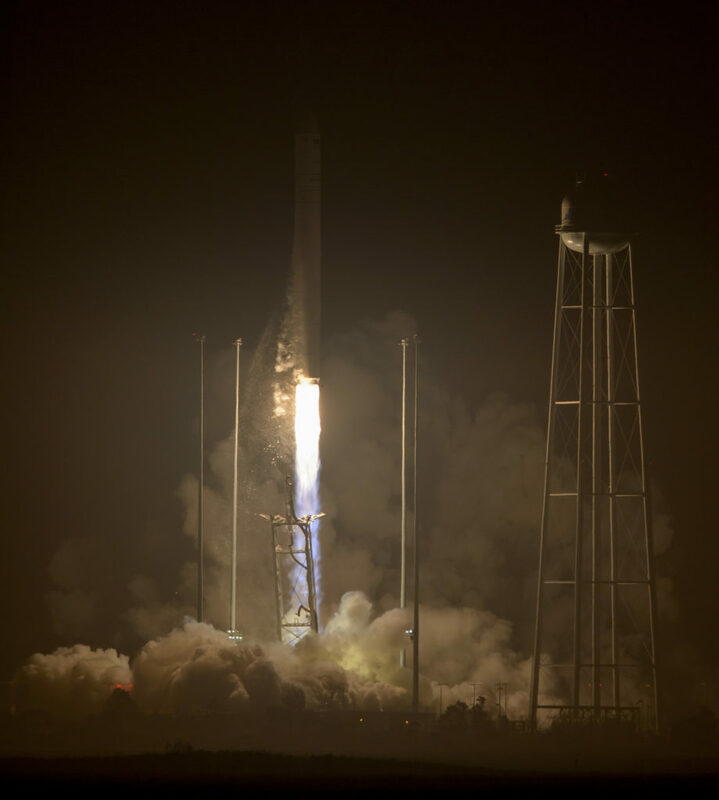 This is the first flight on the upgraded Antares 230 launch vehicle, and the first launch from Wallops since an Antares rocket and its Cygnus spacecraft were lost in October 2014. It’s also the third flight of an enhanced Cygnus spacecraft featuring a greater payload capacity, supported by new fuel tanks and UltraFlex solar arrays. The two previous flights were launched on United Launch Alliance Atlas V rockets from Cape Canaveral. “It’s great to see launches to the International Space Station happening again from the Virginia coast – and it shows what can be accomplished with a close partnership of federal and state agencies, along with the U.S. industry, all working together,” said NASA Administrator Charles Bolden. The cargo aboard the Cygnus will support dozens of new and existing investigations as the space station crews of Expeditions 49 and 50 contribute to about 250 science and research studies. The new experiments include studies on fire in space, the effect of lighting on sleep and daily rhythms, collection of health-related data, and a new way to measure neutrons. Low-temperature fires with no visible flames are known as cool flames. In previous combustion experiments aboard the space station, researchers observed cool flame burning behaviors not predicted by models or earlier investigations. The Cool Flames Investigation examines low-temperature combustion of droplets of a variety of fuels and additives in low gravity. Data from this investigation could help scientists develop more efficient advanced engines and new fuels for use in space and on Earth. The Lighting Effects investigation tests a new lighting system aboard the station designed to enhance crew health and keep their body clocks in proper sync with a more regular working and resting schedule. The system uses adjustable light-emitting diodes (LEDs) and a dynamic lighting schedule that varies the intensity and spectrum of the LEDs in tune with sleep and wake schedules. Research has shown that enhancing certain types of light can improve alertness and performance while other types can promote better sleep. A user-friendly tablet app provides astronauts with a new and faster way to collect a wide variety of personal data. The EveryWear investigation tests use of a French-designed technology to record and transmit data on nutrition, sleep, exercise and medications. EveryWear has potential for use in science experiments, biomedical support and technology demonstrations. Astronauts aboard the space station are exposed to space radiation that can reduce immune response, increase cancer risk, and interfere with electronics. The Fast Neutron Spectrometer investigation will help scientists understand high-energy neutrons, part of the radiation exposure experienced by crews during spaceflight, by studying a new technique to measure electrically neutral neutron particles. The Cygnus spacecraft will remain at the space station until November before its destructive reentry into Earth’s atmosphere, disposing of about 3,000 pounds of trash. The space station is a convergence of science, technology and human innovation that demonstrates new technologies and makes research breakthroughs not possible on Earth. The station has been continuously occupied since November 2000. In that time, more than 200 people and a variety of international and commercial spacecraft have visited the station. The orbiting lab remains the springboard to NASA’s next great leap in exploration, including future missions to an asteroid and Mars.